It's great to see so many local triathlons being organised these days, given the ever rising costs of travelling. One such organisation is Hull based 3xTri (www.3xTri.co.uk). They put on a wide range of events, including the Spring and Autumn Humber Sprints. The venue, South Hunsley Sports Centre, is only 3-miles from my home so I have no excuse for not competing, although it can still be a bit nippy in early April for JSSV, or rather JSSW (W as in Wimp!). The events comprise a 400m swim, 20km bike and 5km run. The idea is to do both events and see how much you've improved (?) over the season. My heel injury meant I couldn't do last April's event, but I did the Autumn one so was keen to see what sort of time I'd produce. My Winter training is mainly gym based and I have a nice gym just a 5-minutes bike ride away which whilst a bit short on gear has a 20m pool so I can practice all three disciplines, plus it has a steam room & sauna. I'm coping with my heel and have got out running this past Winter getting to around 10km in training. I was away on business in Asia for half of March so my training effectively went down the pan, although I did manage a morning run in a big park in Ho Chi Minh City, along with around 500 locals. A number of Vietnamese were also practicing Tai Chi, either by themselves or in small groups and it's fascinating to Western eyes to see it. I got home midday March 30th and suddenly realised I had a race five days later on April 4th. We had a very bad winter in God's county and so I'd never ventured out on my bike (shame, I hear !) - well, that's my excuse and I'm sticking to it! Anyway, I was pretty busy meeting deadlines so I didn't get round to getting out on my bike until the 3rd, after first re-assembling my faithful Giant Composite One which had been languishing in my bike box since my Phuket race last December. Fortunately the rear mech and gears were fine after some lubricants weaved their magic. Race day dawned and thank the Lord it was fine...and sunny! I managed to get into transition through the exit and was duly chastised by a marshall, who fortunately was a good mate so I just suffered a minor ticking off. 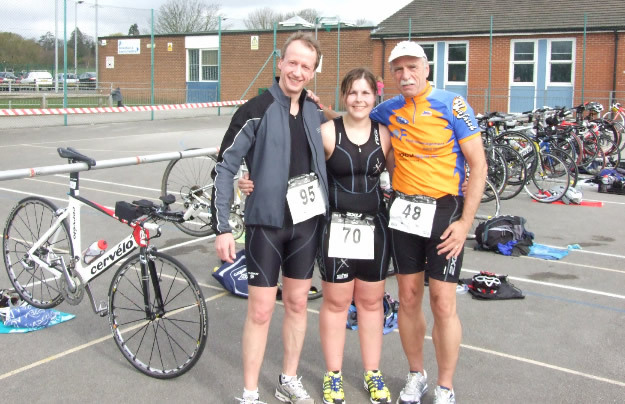 There was a field of 175 athletes, many travelling from West Yorkshire and Lincolnshire, which was heartening for 3xTri. My swim went ok apart from a close encounter with a guy doing breaststroke so I feared the worst time wise but in fact I was 20secs faster than in October - amazing. I opted to wear a couple of zip up garments for the bike as have been embarrassed in the past by having fellow athletes help me put on a tight bike top over my wet back - poor old(er) man that I am ! Off on the bike and all went well. I train over the bike course but even so was amazed at the number of potholes that our hard winter had produced - anyway I managed to elude them and steamed back into T2. I'd just got some glitzy new Saucony Grid Stabils courtesy of my mate Kevin Hayward at Simple Running in Hull, and hadn't got my elastic laces sorted properly - slap hand, what an admission - so that added about 30secs to my infamously slow transition times! Off on the run and my heel felt pretty good. Two laps and that was that. I gathered up my gear and as I headed back to the car park the Tri-Stars were tearing from the pool to T1. It's GREAT to see the young'uns having a go and all credit to 3xTri for their commitment to supporting the kids - well, they are our future Olympians - who knows? On checking the times I was pleased my bike time was only 1min 20sec down on my October effort, but ecstatic that I had shaved 4mins off my run time!! Re my transition times - no comment, but as it says in my old school reports "room for improvement!"